MIRACLE WHIP, Parmesan, peppers, artichoke hearts, green onions and garlic are blended and baked for a savoury hot appetizer. 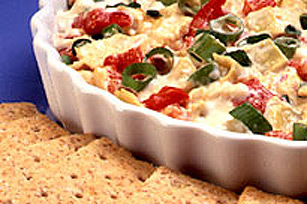 Served warm with crackers, the easy, cheesy appetizer is sure to be a hit at your next get-together. STIR together Miracle Whip, cheese, peppers, artichoke, onion & garlic. SPOON into 9 in (23 cm) pie plate or quiche dish. BAKE at 350°F (180 °C) for 10 to 12 minutes.